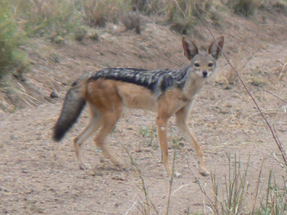 Also sometimes referred to as the silver backed jackal, which is a more descriptive name, this very handsome fox like animal is silvery grey on the back with a narrow horizontal black strip along the flanks separating the darker coloring of the back from the sand buff of the under parts and legs. The tail bushy and silvery grey in co lour like the back, but becomes darker towards the tip. The ears are large and pointed and the muzzier narrow and rather longer than that of the golden jackal. Jackal largely nocturnal in habit but are occasionally seen during the day. They feed chiefly on birds, small animals and carrion and sometimes cause considerable damage to domestic poultry and newly born lambs.